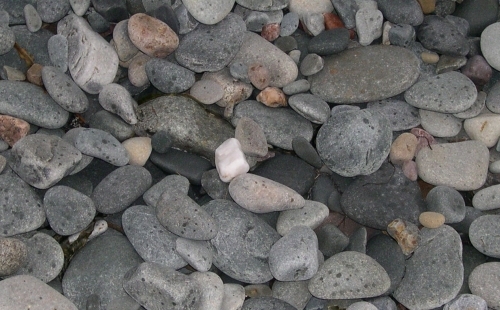 Finding the ideal love is like trying to find a perfectly symmetrical stone on the beach. It’s not easy. Even with so many possibilities, the task is more difficult than one would imagine. And the longer you look, the slimmer the odds of finding that perfect specimen may seem. Though some might appear somewhat perfect at a distance, upon closer inspection, it soon becomes apparent that they are not quite so. That’s not to say that it’s downright impossible to find perfect specimens. They are indeed out there, but be forewarned that many years may pass between one discovery and the next. Whether or not we realize it, we also search for physical symmetry in other human beings. Characteristic of good genes and general good health in nature, perfect symmetry in a mate would likely increase one’s chances of creating healthy offspring. No wonder we’re so drawn to people with beautifully symmetrical faces. And yet, there is a certain charm and character attributable to the not-so-symmetrical. With perhaps an even stronger magnetism, especially where romantic love is concerned, we are drawn towards the imperfect. Why? One theory suggests that while our minds are pleasantly calmed by symmetry, they also quickly become bored with it. Intrigued by complexity, when faced with marginally flawed symmetry, our minds are perked and subconsciously go to work to try and figure out what’s causing the disparity. Although the human body is symmetrical in so many ways, the shape of the human heart is not. Could that be a clue that perfection in matters of the heart was created to be elusive? 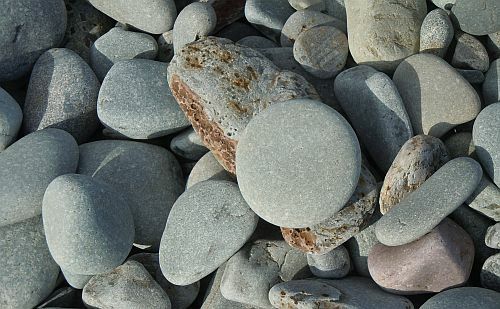 If we are to achieve any semblance of perfection in love, like the rare round stones found sometimes on the beach, it’s only due to years of surviving the pounding waves and stormy seas. Now there’s something to ponder as we approach Valentine’s Day. 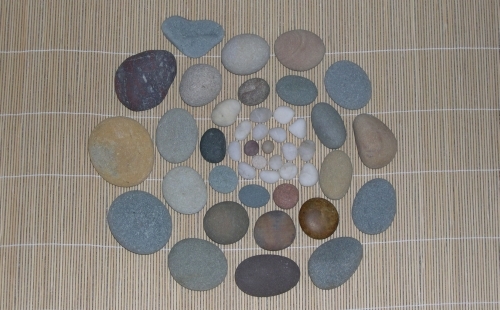 Take a few minutes from your summer and make a mandala from natural materials. 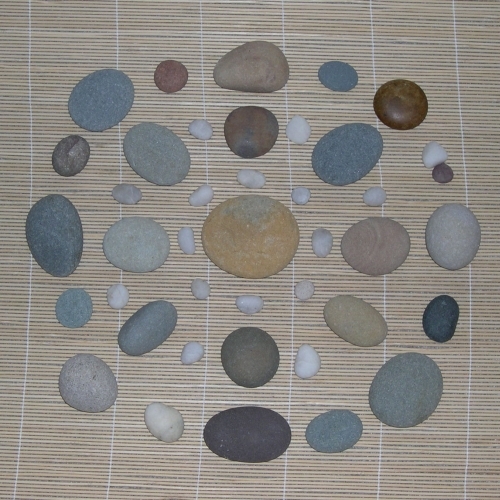 Mandalas are an excellent exercise to help you focus on the moment at hand. You may create something beautiful in the process but don’t worry about perfection. 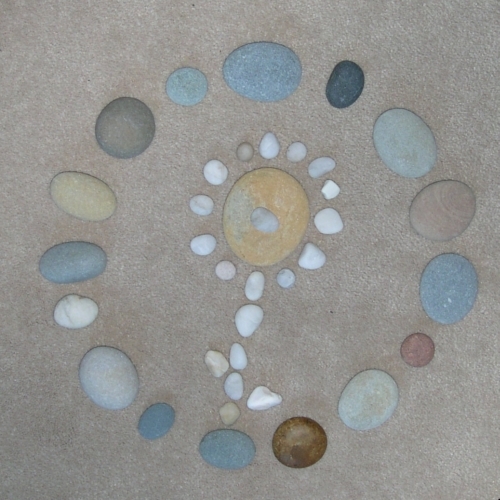 Depending on your intention while creating your mandala, you may construct a sacred space in which to bring your thoughts and prayers. Summer offers a variety of materials: leaves, flowers, twigs and grasses. Your palette of living colors will depend on what’s in bloom in your corner of the world right now. 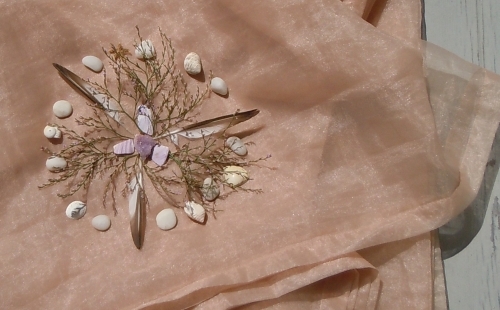 Found feathers, seashells and stones may also be used. The possibilities are endless. You can create one by yourself, with a friend or with a child. Create a circular shape with your materials. You can plan to have a set number of sections in your design or just see what happens. 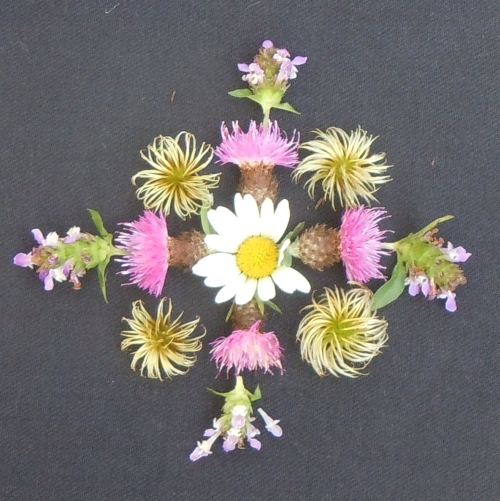 You can make your mandalas outdoors or inside. It doesn’t matter if you keep your arrangement forever, for a day, or just a few minutes. Mandalas are about here and now. 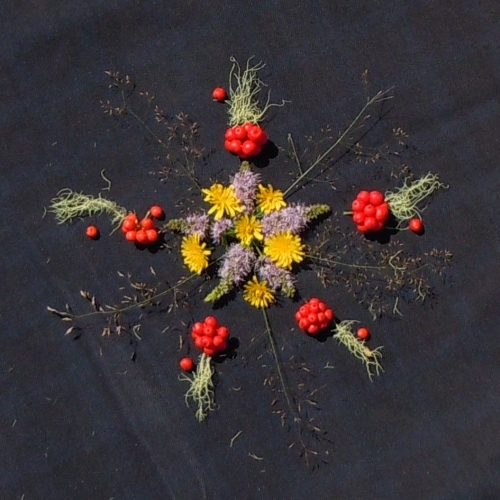 For more information about mandalas, see my previous post on Autumn Mandalas. 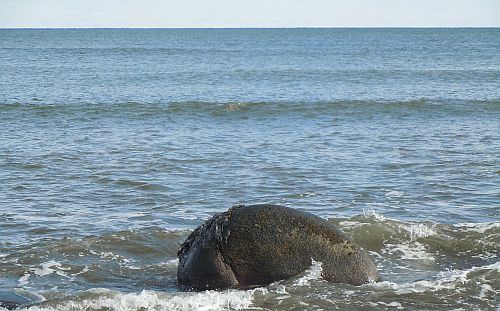 It’s always a good time to go down to the ocean and see what you can find. 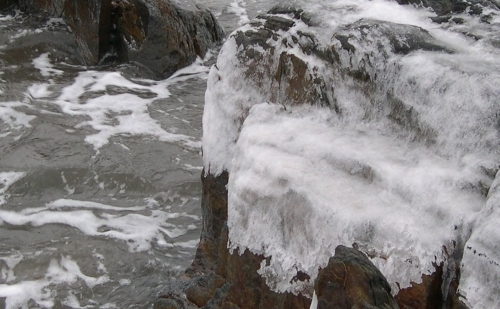 Ice and wind only make the rocks look more interesting. 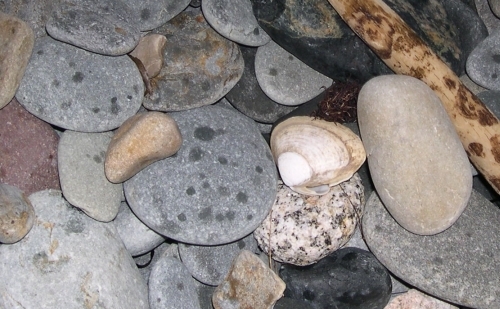 Even if it’s raining, the walk down to the sea is always worthwhile because you never know what treasures are waiting to be discovered on the shore. You don’t have to pick them up to enjoy them. Just leave them where you find them for others to discover too. 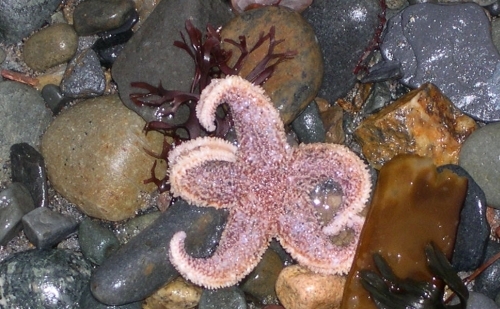 Unless you find a stranded starfish of course. It’s always good to pick them up and throw them back in the water. 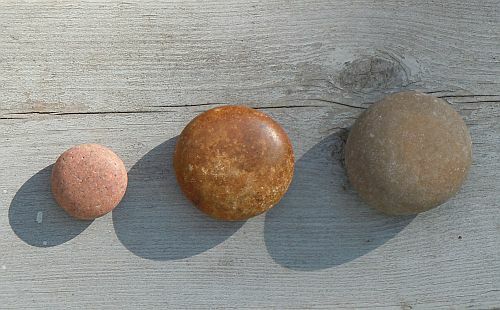 The best trips to the shore are often ones when I can come ‘home with a smooth round stone as small as a world and as large as alone.’ What do you find when you visit the shore? 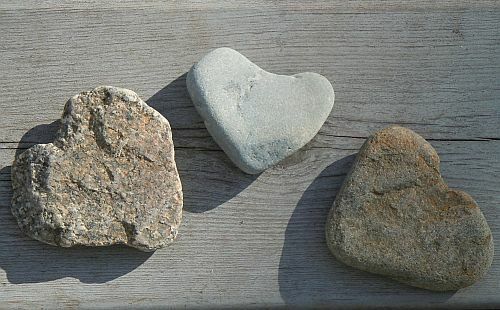 Looking for heart-shaped stones on the beach is something I’d never thought of doing until recently. Many people have collections of these. 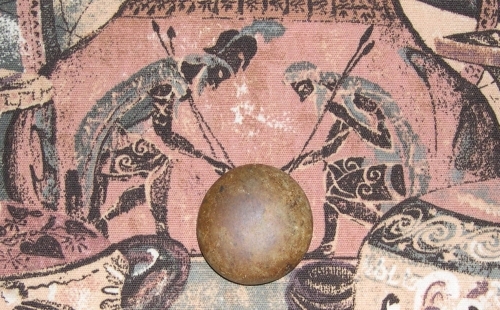 Who would have thought anyone would consider a ‘heart of stone’ something worth searching for? Beaches are favorite places for couples to visit. They take long walks along the shoreline at sunset, or sit on the beach together, gazing out at the horizon while sharing their dreams of the future. 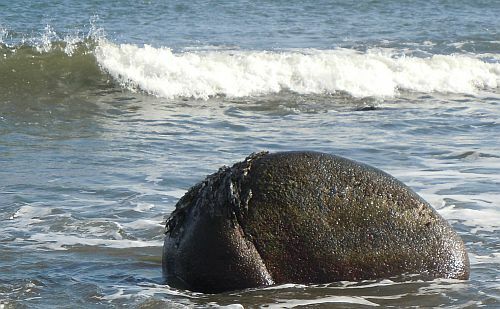 Nearby Rainbow Haven Beach attracts numerous singles seeking summer romance . Glowing with suntan lotion, they bask in the sun while non-chalantly checking one another out from behind their fashionable sunglasses. 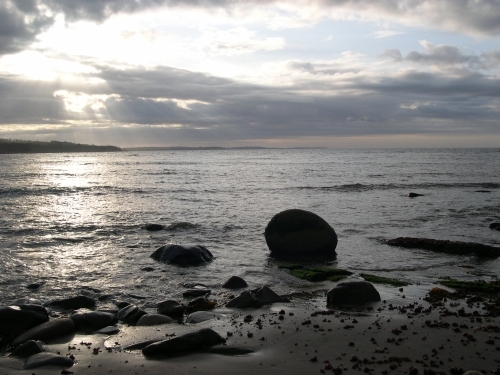 The shore and its pounding waves are sometimes employed by poets as a metaphor for the coming together of lovers. One waits patiently for the other to arrive at long last from afar. But what happens when love dies and couples who walked together so often hand in hand along the sand must now walk alone? If love can begin at the beach, could it not end there as well? This week I found not only one, but several yellow long-stemmed roses tangled in the seaweed on the shore. Although they were a bit frazzled by the elements, they still looked fairly fresh. In the language of flowers, yellow roses symbolize the end of a love affair. Could someone have been given a bouquet of yellow roses at the beach? And could these have then been abandoned on the shore or thrown into the sea? We’ll never know. And drift away with dreams of youth.